Skin irritations aren’t just annoying to cats. Cats with itchy skin can scratch so much they create bald spots and open wounds. While over the counter and prescription products can heal skin irritations, calendula is a gentle herbal treatment that’s safe for cats. Calendula has been used for centuries for its healing and antiseptic properties. Used topically for cats, calendula soothes itchy skin, minor wounds, post-surgical incisions, insect bites, minor inflammation and bruises. It can also accelerate wound healing, say veterinarians Steve Marsden, Shawn Messonnier and Cheryl Yuill. Health food stores sell calendula as a topical cream, ointment, gel or spray. The amount to use and frequency of use depends on the individual cat. 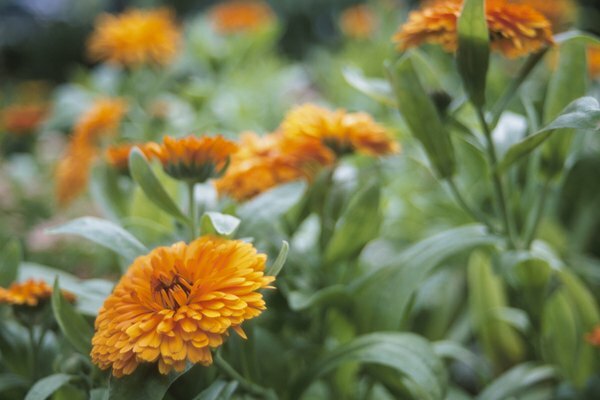 Calendula plants flower from mid-summer to frost. Flowers can be brewed into tea to apply to a cat’s irritated skin. Only calendula flowers are safe for cats. The stems and leaves of calendula plants contain tiny amounts of salicylic acid and could be toxic for some cats. Calendula should not be used on wounds that need to drain, as it could cause the wound to heal too quickly, trapping infection inside.